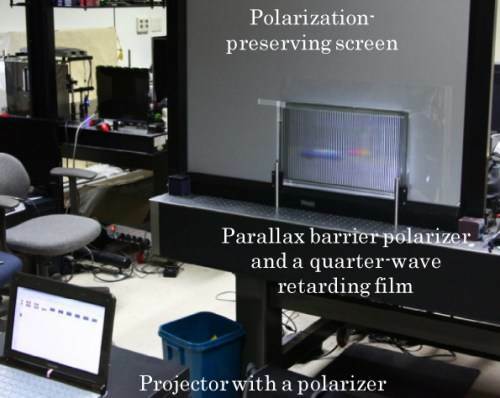 South Korean researchers have created a new method to show 3-D movies without a need for glasses or extra projectors. The method is similar to existing ones but adds a new twist — literally. Having to don ugly and often heavy glasses for a 3-D movie is something no one enjoys, and it's a chore for the theater to keep and clean them as well. So it's no surprise that researchers are scrambling to create a system that can show 3-D without the need for any audience accessories. There are already methods out there, the most widely used of which is probably the parallax barrier method. This uses a special sort of sawtooth lens on the surface of a screen to cause some light to go to a viewer's right eye and some to go to the left. But this requires the light to be coming from behind the screen, rather than behind the audience. Most theaters just aren't set up this way, since it requires far more space per screen. A new method that escapes this problem is being developed by a team at Seoul National University, led by Byoungho Lee. It uses a special layer on the screen to circularly polarize the light, giving it a twisted trajectory that can be partially blocked or redirected. With a complementary parallax barrier or pinhole layer, it can send up to four different images back at the audience, depending on how it's configured. It's promising but still a ways off, the researchers said in a press release announcing the new technique. The paper, published Monday in the journal Optics Express, describes the method as cost-effective and mechanically quite simple, but still perhaps years from implementation.